All the components of your car are important, but the brake is one of the most important parts. It ensures your safety while riding the car. Other people also remain safe if your car’s brake is alright; if you know what I mean. However, getting a clean brake rotor increases the attractiveness of your car beside ensuring that the brake is alright. So, you need to keep the brake rotor clean and smooth. 1 When You have to Clean Brake Rotors? When You have to Clean Brake Rotors? The outside environment is always ready to make your brake rotors dirty. So, what to do? Will you keep your car in the garage for a long time so that it doesn’t get dirty? This is not a good solution because this also possesses the possibility of building up rust on your brake rotors. The only way is to clean your brake rotors regularly. In most of the cases, people focus on cleaning the brake rotor after noticing rust on it. So, cleaning the brake rotor generally means cleaning rust from it. I made the same mistake at first and ended up buying a new rotor. As the owner of a car, you have many options for cleaning the brake rotor of your car. You can perform those in your garage workshop. But if the rust development is high, you may have to run to a professional to take help. However, let’s see how to clean brake rotors at home. Regular Clean-up: This is the basic type cleaning up of your brake rotors. Just like you rub your car with a clean piece of cloth every day, make sure that you do the same to your brake rotor. Take a piece of clean cloth and remove the dust from the rotors. Try to go as deep as possible. You can use a brush instead of dry cloths. You’ll see that whenever you go out with the car, dust covers the outside surface. The same thing happens to the rotors too. Regular cleaning up of rotor removes the dust and prevents dust accumulation. Thus the brake performance also remains good. Braking Away the Rust: This method is generally used if the rust build-up happens because of keeping the car idle for a few days. I have left my car for one and a half months as I went outside the country. However, when I got back home, I have found that there was some rust. Then I used this method to remove the rust. The process is easy. You need to find an empty place where you can drive freely at a low speed. Drive there at 5-10 miles per hour and press brake continuously. Here make sure that you press the brake to stop the car slightly more sharply than normal driving. This will ensure harsh friction between the brake pad and the rotor. The friction will remove the rust from the rotor and make it clean. Don’t do this more than 5-6 times because it may erode the rotor. Also, make sure that there is plenty of space to do this. Using Dishwasher and Scrub: If you are someone who can take out the brake rotor, this method is for you. In this method, you can clean the dust accumulated on the rotor. It is very simple- take the rotor out, get some dishwasher and scrub and clean the rotor with the dishwasher and scrub. After cleaning properly, remove the water immediately with the help of a piece of dry cloth. In this method, you can clean the dust accumulated in the tough-to-reach portions. I suggest you do this once in two months. But in this method, you can’t remove the rust. Using WD-40: This method works great if there is light rust build-up on the rotor. When you see a light build-up of rust, spray some WD-40 over it. You can use other penetrating oils too. After spraying, leave it for a long time, maybe 5-10 hours depending on the amount of rust. After that, take a sanding paper and wipe the rust away from the rotor. If you want a better result, take out the rotor and follow the process. Thus you can get access to the whole surface of the rotor. Using an Angle Grinder: If you are a DIY worker and find heavy rust build-up on the brake rotor of your car, this is the best method for you. The process is simple. At first, make sure that you have a brush wheel for your angle grinder. Then, take the rotor out from the car. After that, adjust the brush wheel to the angle grinder and switch it on. Now you have to move the angle grinder over the rusty portions of the rotor. Don’t apply much pressure as it may eat away the surface and make it uneven. Apply the grinder so that it only hits the rust. After finishing the process carefully, you’ll get a clean and rust-free brake rotor for your car. Other Ways: The methods shown above are for you if you want to spend some time taking care of your car. If you don’t have enough time to do these, I suggest you send it to workshops. They will use a lathe or other equipment to clean the rotor. Or if you think that the rotor has traveled enough, you may focus on replacing it with a new one. Cleaning the brake rotor is not a tough task if you have some time and necessary things. If you love DIY, the task is more interesting to you. 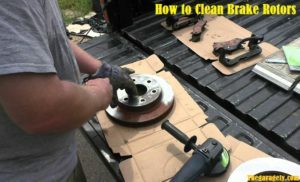 Here I have shown five different ways on how to clean the brake rotor. These five can be applied in 5 different types of problems. If you are regular in it, you may have a better idea. You too can share your idea with us. Comment your method of cleaning the brake rotor if you think that it is worth sharing.